Forever My Always projects with Guest Enza Gudor! - Pebbles, Inc. 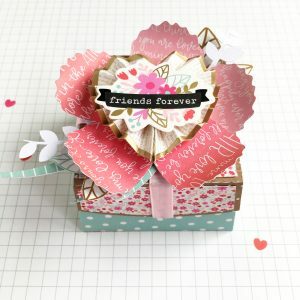 Forever My Always projects with Guest Enza Gudor! Hello everyone! 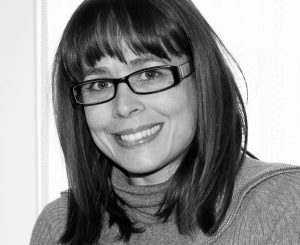 My name is Enza Gudor, and I am so excited to be here this month to share some projects with you. I have always loved Pebbles collections, so I am thrilled to have had the opportunity to create with one of my favorite lines: Forever My Always. This first project is a layout. Although I love all kinds of crafts, I’m a scrapbooker at heart. For the “Who do you love” theme this week, I decided to go with a picture of my little ones. 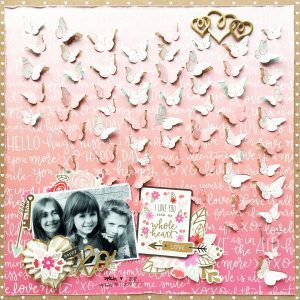 My idea was to create a soft and sweet layout that complemented the photo. As it often happens, I started with a cut file. 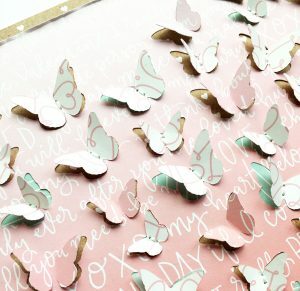 I love all the tiny butterflies on the background, and the dreamy and whimsical look they bring to the page. I layered some of them with vellum for more dimension, while I kept the other ones as a single layer to let the mint patterned paper peek through. Most of them were hand-stitched down to keep them in place. Since the background was pretty busy, I decided to limit myself with the rest of the embellishments. How difficult it was! I love every single piece in this collection! I simply adhered the photo down with foam adhesive for dimension and framed it with stickers and die-cuts. 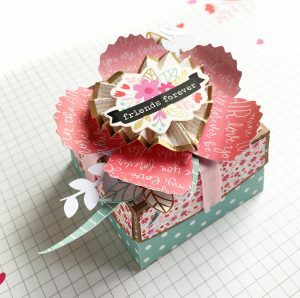 The dimensional rosettes, as well as the floral images and sweet sentiments, are absolutely lovely. 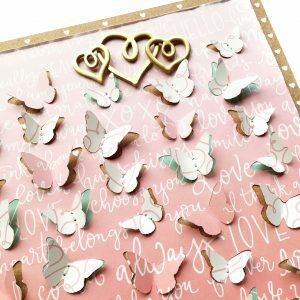 To balance the bottom left corner and to finish the layout, I layered three of the Foil and Foam Sticker hearts in the opposite corner of the page. My second project is a card/gift duo. Random Acts of Kindness Day is coming up next week, so I thought it would be fun to share how I’m planning to surprise and lift someone’s spirit with an unexpected card or small present. For the card, I mostly used the 6×6 Paper Pad. 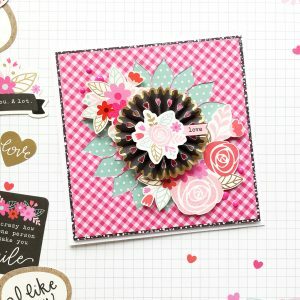 The smaller patterns are perfect for the 5’x5′ inch format of this card. The circular rosette inspired the floral design. The cut file I used for the top layer lets the fun polka dot paper come through and bring in a contrasting color. I tucked some floral die-cuts and stickers on opposite sides of the rosette and added some enamel dots as a finishing touch. The little gift box was a lot of fun to make! 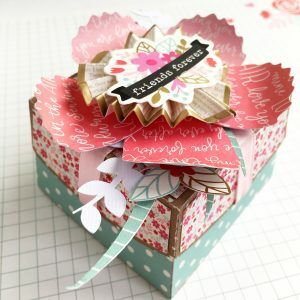 After assembling the box, which I cut with my electronic die cutting machine out of several patterned papers from the collection, I started working on the lid to recreate the same floral idea of the card. First, I glued the ribbon in place to keep it from moving. 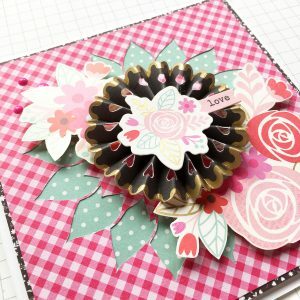 I went on building the layers of the flowers by adhering the following elements on top of each other: die-cut petals (which I curved a little to make them look more realistic), fussy-cut leaves, and the heart rosette that I love so much. I find that the sentiment is perfect and the dimension it adds is fantastic! I finished it all with some foliage from my stash. I hope you have found some inspiration in my projects today. Thank you so much Pebbles for having me as your guest this month! Have a lovely day!